I was excited to read recently that Halton Region had come out with an updated cycling map for our area. I confess, I hadn’t really looked at the old one, but surely with online mapping technologies like Google Maps we would now see a really useful tool for cyclists. Not only are the maps rudimentary and poorly labelled, they are in PNG format which is basically just a static picture. For example, the map for South Burlington shows a simple loop that goes along Lakeshore Blvd, up Burloak, and then diagonally south west along… a street? a trail? 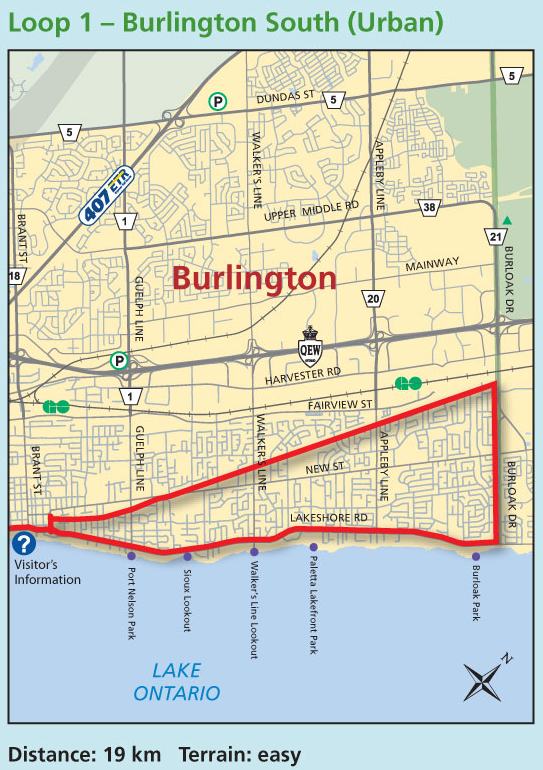 If you don’t know Burlington well, you’d never guess from this map. May I suggest Childs Drive as an alternate? Ottawa, Vancouver, Toronto, and many other towns and cities have demonstrated what can be done if you bring technological and cycling expertise together. Sadly, Halton’s maps display neither. The Region is asking for feedback on their new maps, and I for one plan to give them some.